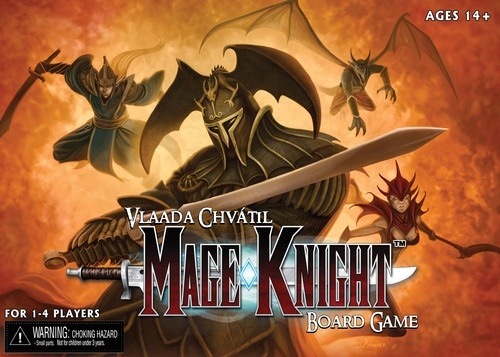 Two days after our first play of Mage Knight, we had to do it again. It was all we could think about. Ok, it was all I could think about, but Jessica really liked it as well. 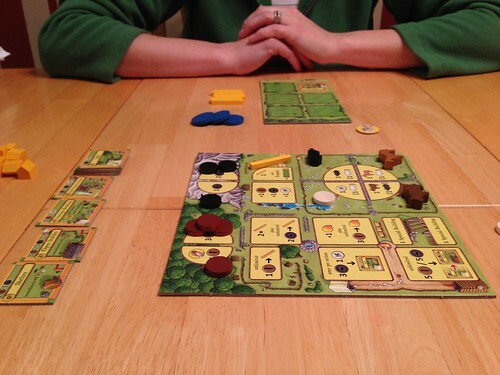 So, on Sunday, 1/6, we played another round of the tutorial scenario. Right off the bat, I got an edge by taking the really easy bad guy that showed up. This is important because your first kill will get you your first level-up fast. Jessica wasn’t quite so lucky, and that initial separation between the two of us only grew throughout the game. I managed to draw really good cards throughout the game, even taking about some pretty sweet fire mages at some point. Jessica, however, always seemed to get unfortunate card draws that led to a lot of stagnant turns. It was a little painful to watch at times, but not so painful that I wouldn’t swoop in a take-out the bad guys that Jessica would flush out but not kill. 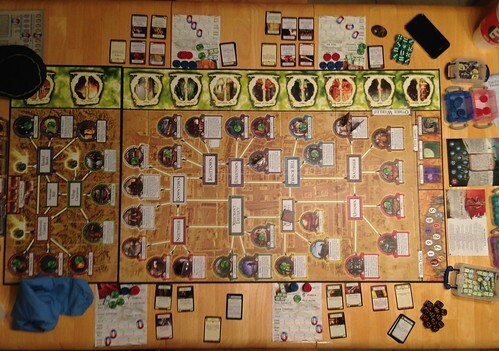 On Friday, 1/11, we brought out our all-time favorite game, Arkham Horror, to break in one of the new expansions we got for Christmas, Curse of the Dark Pharaoh, and to use some of the cool new custom pieces Jessica got me. 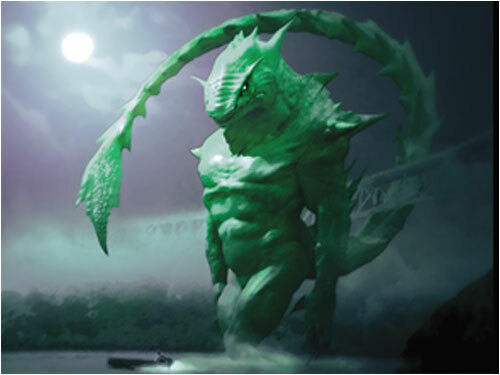 In Arkham Horror, you play an investigator who goes about the city of Arkham gathering clues about the Mythos that you can then use to seal portals to other worlds and dimensions. You fight to stay sane and conscious as you encounter all manner of horrifying monsters and events. You know, some light-hearted fun! In this session, we sought to prevent Bokrug from awakening. He had some minions that were trying to bring about our demise with their evil presence. On top of that, the Dark Pharaoh was acting as a herald for Bokrug and made it deadly to obtain magical items. Things were a bit grim. We had to overcome one burst seal on a gate as well as some other frustrating things, but we persevered and won the day! The End of the game. Look at all those monsters. Don’t they look sad that they can’t eat us? In the picture above you can see some of the sweet new pieces Jessica got me for Christmas. On the bottom left (and bottom-right) at the top of the white character sheet, you’ll see a stack of red pieces and a stack of blue pieces. Some guy in Texas made these from polymer clay and are fantastic. I’ll get a better picture next time we play. Also, if you look towards the bottom-right of the board between a green and yellow box, you’ll see a brown circle with a star symbol on it. 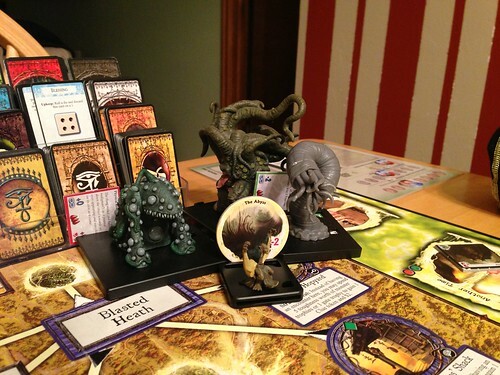 That is an Elder Sign, and the same guy made these from a fallen branch off one of his trees that happened to be the exact same diameter as the locations on the board. The Curse of the Dark Pharaoh adds some nice items and spells to the standard decks. The Exhibit Items were pretty interesting, though the Dark Pharaoh herald made it very hard to want one. Every time we picked up an Exhibit Item, we were cursed. I’d say next time we probably won’t bother with that herald. Gardner’s Place in Dunwich didn’t fare very well. 4 monsters in one place! 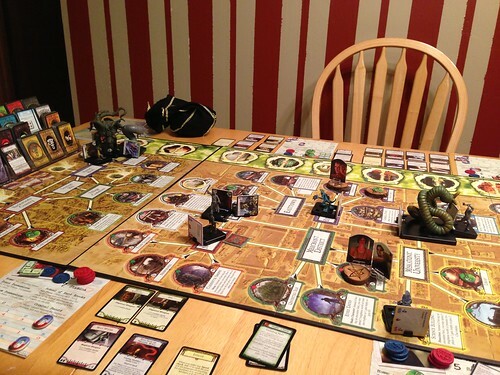 We played with the Dunwich expansion as well, but we didn’t spend much time up there. Jessica made it up there early to seal the gate on Wizard’s Hill and never returned. Gardner’s Place was a sight to see. Or not see. Always choose the latter when a Dark Young, Proto-Shoggoth, and Chthonian (and vampire, but he was weak sauce) have a party. 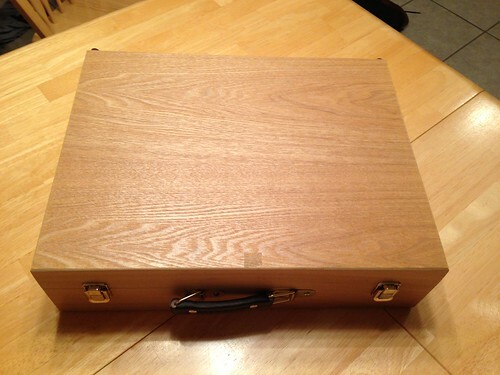 We store the game in an artist’s box we got at Hobby Lobby. 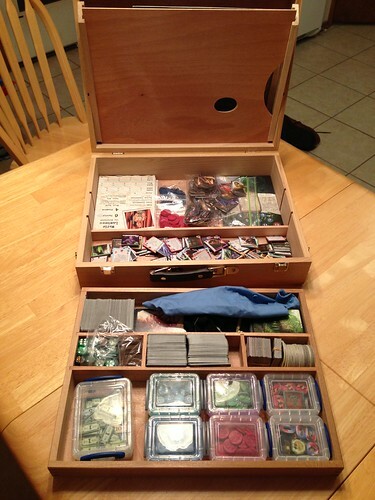 It fits everything quite well, though not both Dunwich and Innsmouth expansions. We swap those in and out and play with one for a while before switching back. Above is the box fully deployed, and below is it closed up. We will one day put a vinyl Elder Sign on the front or even burn it in. We’ll see.